Historians will tell you that all that remains today of the second temple in Jerusalem is the western wall of the temple court. Actually, the Western Wall or Wailing Wall that is found today was built after the destruction of Jerusalem. It is not really the "Western Wall". Other traditional historical sites such as the upper room, eastern gate, and Via Dolorosa in Jerusalem are incorrect. Even the "old city" is not the Jerusalem from the time of the Lord Jesus Christ. They were rebuilt after the destruction of Jerusalem. In Matthew 24:1-2 we find, "And Jesus went out, and departed from the temple: and his disciples came to him for to shew him the buildings of the temple. And Jesus said unto them, See ye not all these things? verily I say unto you, There shall not be left here one stone upon another, that shall not be thrown down." Luke 21:5-6 reads, "And as some spake of the temple, how it was adorned with goodly stones and gifts, he said, As for these things which ye behold, the days will come, in the which there shall not be left one stone upon another, that shall not be thrown down. Really this would suggest that even the foundations would be torn up. 42 Saying, If Jerusalem hadst known, even Jerusalem, at least in this Jerusalem's day, the things which belong unto Jerusalem's peace! but now they are hid from Jerusalem's eyes. 44 And shall lay Jerusalem even with the ground, and Jerusalem's children within Jerusalem; and they shall not leave in Jerusalem one stone upon another; because Jerusalem knewest not the time of Jerusalem's visitation. Matthew 24 was a follow up to the prophecy about Jerusalem in Luke 19. Before Jesus was born a greater prophecy was given. Plowing the city would tear down every wall and turn up every stone even in pavement. In Jeremiah 26:18 the princes and all the people quoted this prophecy. This was done to the second temple and Jerusalem. When the first temple was destroyed this was not done. Lamentations 1:3-4 says, "Judah is gone into captivity because of affliction, and because of great servitude: she dwelleth among the heathen, she findeth no rest: all her persecutors overtook her between the straits. The ways of Zion do mourn, because none come to the solemn feasts: all her gates are desolate: her priests sigh, her virgins are afflicted, and she is in bitterness." Chapter 2 verse 9 adds, "Her gates are sunk into the ground; he hath destroyed and broken her bars: her king and her princes are among the Gentiles: the law is no more; her prophets also find no vision from the LORD." In Lamentations 2:11, 12, 19, 21, 4:1, 5, 8, 14 and 18 we see the streets referenced. Lamentations 4:1 says, "How is the gold become dim! how is the most fine gold changed! the stones of the sanctuary are poured out in the top of every street." Lamentations 5:2 says, "Our inheritance is turned to strangers, our houses to aliens." Deuteronomy 28:52 warned, "And he shall besiege thee in all thy gates, until thy high and fenced walls come down, wherein thou trustedst, throughout all thy land: and he shall besiege thee in all thy gates throughout all thy land, which the LORD thy God hath given thee." The gates and high walls of Jerusalem would come down. 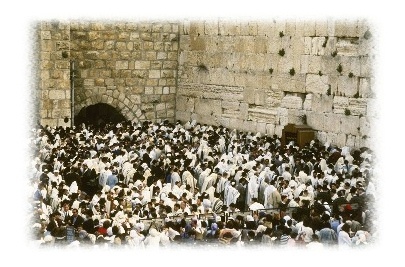 After Jerusalem had been taken the first time the gates were broken and had sunk down but there they were still there. They were torn down instead by the Romans at a later date. There were still streets and some houses were standing after the Babylonians were finished but not after the Romans were done. Secular history teaches that the emperor Hadrian plowed Jerusalem in 135 AD and even had coins minted to show this. Ezra 6:5 And also let the golden and silver vessels of the house of God, which Nebuchadnezzar took forth out of the temple which is at Jerusalem, and brought unto Babylon, be restored, and brought again unto the temple which is at Jerusalem, every one to his place, and place them in the house of God. Psalm 68:29 Because of thy temple at Jerusalem shall kings bring presents unto thee. If Jerusalem was laid even with the ground and not one stone was left upon another, the wall that is at the temple mount today was not a part of Jerusalem in Jesus' day. Furthermore, for one stone not to be left on another then the bottom stones would have to be pulled up. If the building were just dropped the bottom stones could not be pulled up. The top stones and walls would have to be put in another place other than above the foundation. Therefore where the pile of stones is the temple mount was not. It appears the scholars are digging in a trash pile. When the Waqf has dug below the so-called temple mount what have they found? They have found trash. Jesus celebrated the passover the night before he was crucified. Now called the Lord's supper, this was held in a location often called the upper room. 12 And he shall show you a large upper room furnished: there make ready. Jerusalem tour guides have shown people upper rooms in the city and said it was the place where Jesus and his apostles held the last supper. However, because the upper room was in Jerusalem, we know that it was destroyed when the Romans ruined city. Any location you are shown today is a fake. Yes, there was another upper room in Jerusalem. It was where the apostles waited for the Holy Spirit of God to come. Acts 1:12-13 says, Then returned they unto Jerusalem from the mount called Olivet, which is from Jerusalem a sabbath day's journey. And when they were come in, they went up into an upper room, where abode both Peter, and James, and John, and Andrew, Philip, and Thomas, Bartholomew, and Matthew, James the son of Alphaeus, and Simon Zelotes, and Judas the brother of James. Jerusalem tour guides have shown this room to people as well, but the like the location of the last supper it was destroyed long ago. Ezekiel 44:1-4 says, "Then he brought me back the way of the gate of the outward sanctuary which looketh toward the east; and it was shut. Then said the LORD unto me; This gate shall be shut, it shall not be opened, and no man shall enter in by it; because the LORD, the God of Israel, hath entered in by it, therefore it shall be shut. It is for the prince; the prince, he shall sit in it to eat bread before the LORD; he shall enter by the way of the porch of that gate, and shall go out by the way of the same. Then brought he me the way of the north gate before the house: and I looked, and, behold, the glory of the LORD filled the house of the LORD: and I fell upon my face." Tourists to the city visit what the guides tell them is this gate and are told nobody has entered into it. It is shut and waiting for the Messiah to enter. What they won't tell you is that Ezekiel 44 refers to the second temple not the third temple. See The Third Temple. As part of the second temple it was completely decimated during the days of Emperor Vespasian reigned. Read more on Vespasian. This is another location where scholars, pastors and tour guides are passing ignorance along to the masses. Via Dolorosa is thought to be the street or path Jesus walked on his way to die on the cross for our sins. To read more see Via Dolorosa. It was part of the Old City of Jerusalem which means it was completely destroyed. Even if the buildings were still standing there is not a way to know which path Jesus took. To say you know is a lie. The buildings along the route may be very old but they are not the ones Jesus walked by.